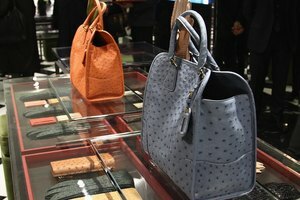 Fendi is a top name when it comes to luxury handbags and accessories. 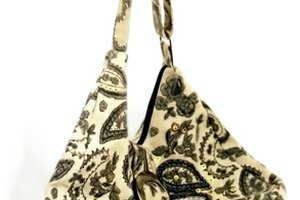 A Fendi purse is not only a fashion statement but an investment; they typically last through many years of use. Fendi handbags can be bought in fine boutiques, department stores and Fendi retail stores, and can cost anywhere from $700 to over $2,000. Though they are of high quality, like any handbag, a Fendi purse can become dirty or damaged. If your Fendi bag is in need of repair, there are a few options you can consider when it comes to fixing it. Take the bag to your nearest Fendi store. (This option is only for those who bought their bag at a Fendi boutique and still have the receipt.) With your receipt, your handbag can usually be cleaned, repaired or exchanged free of charge if it's within a year of the original purchase date. If it has been longer than a year, there are still repair options available to you. Clean stains from your cloth Fendi bag by lightly blotting the fabric with a warm, damp towel. This is most effective if you attempt to clean the bag soon after it is first stained. If the stain doesn't come out with water, do not use cleaning detergents or bleach; this can ruin the fabric's coloring. Return the Fendi bag to the department store you bought it from--such as Neiman Marcus, Bloomingdale's or Saks Fifth Avenue--if you still have your receipt or proof of purchase. As with flagship Fendi boutiques, department stores will often repair or replace a Fendi bag for free, as long as you have proof that you bought it there. Send the Fendi bag to a designer-handbag repair company, such as Extra Care Handbag Repair (Burien, Washington), Avelle Refurbishment (Middleton, Wisconsin) or Artbag (New York City, New York). These handbag-repair companies specialize in cleaning, deodorizing, patching and reconstructing authentic luxury purses. The cost for repair will depend upon what needs to be fixed, but it typically ranges from $45 to $250, not including shipping fees. How Do I Get My Prada Warranty Covered?